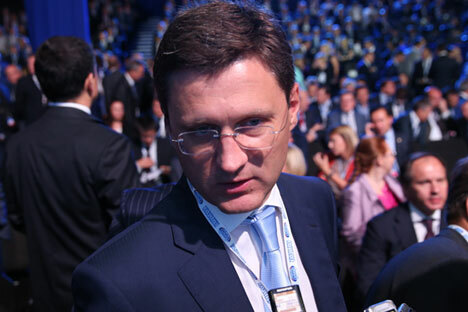 Russia's Energy Minister Alexander Novak. Similar meetings have been held earlier, though now the situation has changed due to continuing plunge of prices. Russia has confirmed participation in the meeting of the Organization of the Petroleum Exporting Countries (OPEC) and other oil producers for discussing low oil prices and coordination of a potential crude production cut due in February, Energy Minister Alexander Novak said on Thursday. "Currently the OPEC member-states are trying to convene a meeting with participation of other OPEC (member-states) and non-(member-states) in February. Certain countries have come forward with this initiative, currently the issue is being worked out with the countries. On our part we’ve confirmed our potential participation in such a meeting," Novak said. According to the minister, the date for the meeting has not been set yet. "The date does not depend on us. We can meet any time. The date is being agreed with other countries now," he added. Similar meetings have been held earlier, Novak said, though now the situation has changed due to continuing plunge of prices. "Everyone estimates how long those prices will be recovering. We think it’s reasonable to discuss the situation," the minister said. He added that the consultations concern issues "related to estimation of the situation on the market, low prices and possible options of production coordination."